Day 22: Grace and Truth | You Can Shake the Gates! Day 22: Grace and Truth – You Can Shake the Gates! We bought a GMC Suburban for a few reasons: winter driving (ours is 4 x 4) and 8 seats plus cargo room to boot. Missionaries drive a lot of miles while in the U.S. and face a lot of different kinds of road conditions. Parents, what do you do on long road trips (sometimes spending days or weeks at a time traveling)? Playing the “silent” game only lasts for so long. The license plate game becomes the billboard game becomes “I Spy” . . . Focus on the Family did our family a favor when they started producing the Focus on the Family Radio Theater series on compact disc. Utilizing professional actors, they dramatized beloved stories like Louisa Mae Alcott’s Little Women and C.S. Lewis’s The Chronicles of Narnia. One of my favorites of all, though, was their excellent interpretation of Victor Hugo’s Les Miserables. The story, which takes place in early 19th century France, involves the tenuous relationship between Jean Valjean and police Inspector Javert. Valjean was a man given a 19-year sentence of hard labor for the crime of stealing a loaf of bread to stave off hunger. The story opens with Valjean, having been released on parole, being offered shelter by a Catholic priest. He receives the hospitality by stealing the priest’s silver and fleeing. He is caught by the police and returned to the priest. The priest disappears into a room and brings two expensive silver candle stick holders. Giving them to Valjean, along with the silver, he asks only one thing: “Take the silver and use it to become an honest man.” Broken, Valjean vows, “Another story must begin . . .” Slipping away into the night (and away from the police), he takes on a new identity and becomes not only an honest man, but one who lives a life of radical grace and generosity. Javert acts only according to a sense of justice devoid of mercy. He is more a caricature than a character, considering Valjean’s 19-year sentence as appropriate for the crime of stealing a loaf of bread. He was completely blind to the transforming power of grace, believing that mercy perverts justice. Jean Valjean’s character is a beautiful picture of a man who experienced the power of two realities: grace and truth. The priest never indicated that Valjean was anything but a thief and a powerful, violent man. Yet, the priest knew that if Valjean were exposed to radical grace, God just might allow the old story to close, and allow a new story to begin. . .
John, perhaps said it best in John 1:17, “For the law was given through; grace and truth came through Jesus Christ.” A bit earlier in the passage, “And the Word became flesh and dwelt among us, and we have seen his glory, glory as of the only Son from the Father, full of grace and truth.” John 1:14. True grace does not deny uncomfortable realities and doesn’t lead us to believe that we are not guilty. True grace looks our guilt in the eye and then deals with it–radically. Truth, the kind that brings us into intimate relationship with Christ, is revealed to us with clarity and detail in the Bible, which is best understood and obeyed when it is given in the language that speaks to our hearts. The Somau Garia have had but a taste of the gospel in the language of their hearts–The Gospel of Mark, in circulation since Easter Sunday, 2007. Twenty-six books remain to be translated. Truth remains to be grafted into the hearts of the Somau Garia. The transforming power of the gospel is only a few short years away from being accessible. Would you join with Pioneer Bible Translators, the Owen family, and the group of current ministry partners in getting the Word out to the Somau Garia people? Clicking here will connect you with us by email to get you signed up for the prayer team. Clicking here will take you to our Donate page, which will acquaint you with how to financially partner with PBT in the transformational, high-impact ministry. 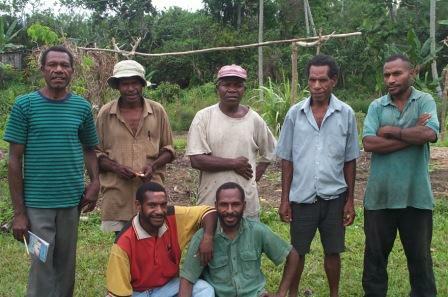 This entry was posted in Ministry News & Opportunities, Shake the Gates Press, Uncategorized and tagged cross-cultural, grace, missionaries, missions, Papua New Guinea, prayer, Somau Garia, translation. Bookmark the permalink.